Minneapolis is one of the best cities I’ve ever visited. I’m biased because I live 10 minutes away from downtown, but I’m confident it’s one of the prettiest cities in the United States. I’ve found myself going on solo photo excursions more often recently, and have decided to document them. Most of the time I write about menswear products, but today I bring you my photos and thoughts of Gold Medal Park and Mill Ruins Park, both located near Downtown Minneapolis. Gold Medal Park is a 7.5 acre area smack-dab in the heart of the riverfront Mill District in Minneapolis. The breath-taking focal point of the park is the observation mound at the center of a spiral walkway, rising out of a green lawn surrounded by over 200 trees. The park offers stunning views of downtown and, during evening hours, benches glow blue with LED lights that add a one-of-a-kind experience to the park. Gold Medal Park in Minneapolis was at one time the flour-milling capital of the world. Now, it’s a vibrant cultural center and mixed-use urban neighborhood. Created and funded by the McGuire family, the park is currently supported by the Gold Medal Park Conservancy. The Conservancy’s mission is to maintain the character and quality of the park while enhancing its contribution to the health and well-being of the surrounding arts and residential community. Major destinations surround the park adding to the neighborhood’s energy. 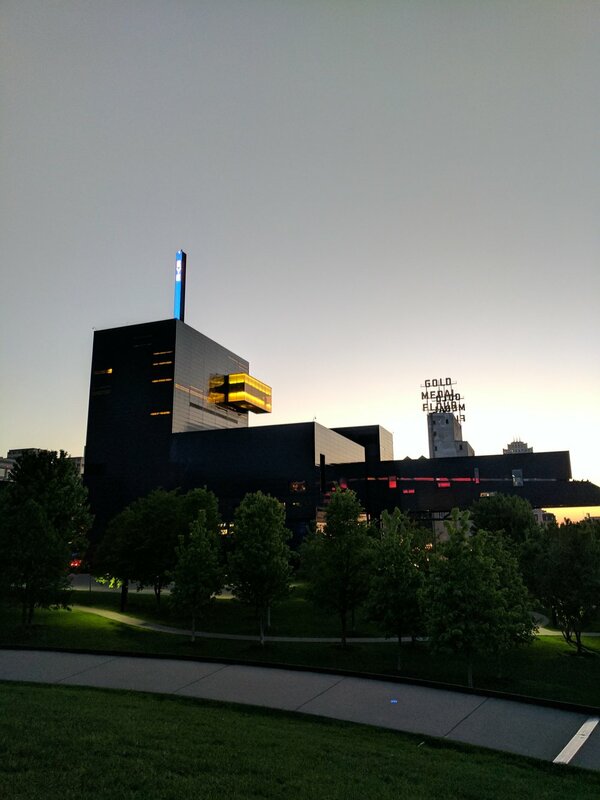 These sites include the Guthrie Theater, the Depot, MacPhail Center for Music, the Mill City Museum and Farmer’s Market, and Izzy’s Ice Cream. I always love venturing into the mill city ruins or mill ruins park, whichever you prefer. They’re located in the heart of the city of Minneapolis and are near the Guthrie Theater. With the Guthrie on one side and the Mississippi River on the other, Gold Medal Park is a great place for a family picnic, a first date, or for wondering around the city. The picturesque backdrop is perfect for a fun afternoon. Mill Ruins Park in Minneapolis is a quick walk from other Minneapolis staples. You’ll find such landmarks as St. Anthony Falls, West River Parkway, and the Stone Arch Bridge all within walking distance. When walking around the Gold Medal Park and Mill Ruins Park areas, there isn’t a bad angle in site. You can walk down to and around various ruins throughout the park, which add a ton of character to the park itself. The ruins throughout the park come with markers that explain various historical significance throughout the park. These are always fun to read if you’re a bit of a history buff like myself, otherwise feel free to continue to wander around the park getting lost in the surrounding beauty. I’m very fond of the Gold Medal Flour sign that provides a bright, vibrant yellow glow against the night sky, or a great contrast with the blue sky on a sunny day. That sign matched with the sharp and bright angles of the Guthrie Theatre is something even the most seasoned photographer would be inspired by. I took my first trip here when I was just getting started with photography and it really helped me get more comfortable with not only my camera and it’s settings, but also street photography and shooting in the day time. I highly recommend checking this area out if either of those two things are goals of yours. Some of these photos might not be the greatest. I’m very proud of them because they clearly show progress and always inspire me to go back and get better. You can view the rest of my portfolio on my Instagram!